With seven seconds left in the game, Olivier Hinse stood at central ice, his head hanging low, ready to take the final face off of his U Sports career. A few moments before, Queen’s Gaels forward Dylan Anderson dashed Concordia’s hopes of tying the game by scoring an empty net goal to give his team a 2-0 lead and ultimately seal the win for his team at Ed Meagher arena Sunday night. The buzzer sounded off and the game was over. On one side, Gaels players celebrated in sheer elation. On the other side, Stingers players gathered around Hinse for a final team huddle. 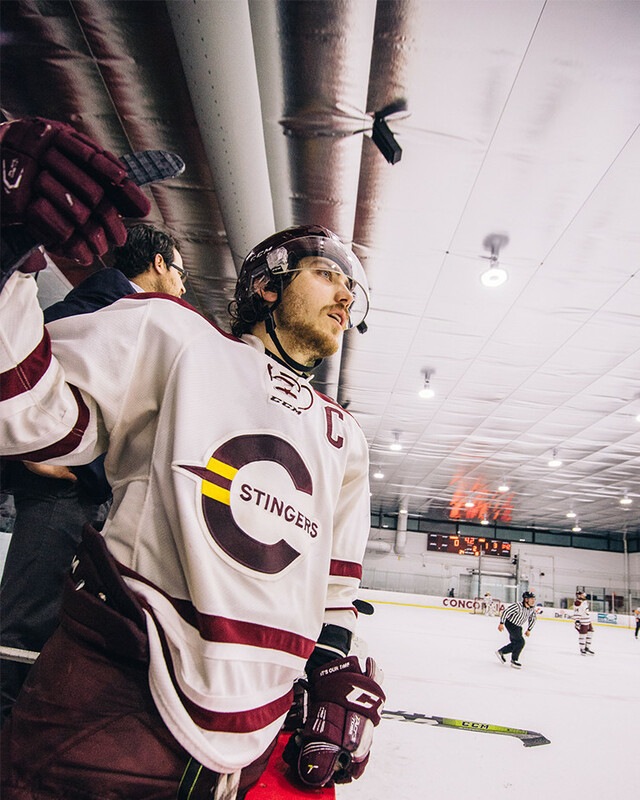 With the crowd on its feet, cheering on the team, the Concordia Stingers playoff run had come to an end. Tears streaming down his face and emotions running high, the captain said his final goodbye to an almost sold out arena, holding his stick high and proud. From players to fans and family, everyone wanted to see the Stingers win—Everyone wanted to see Hinse win. 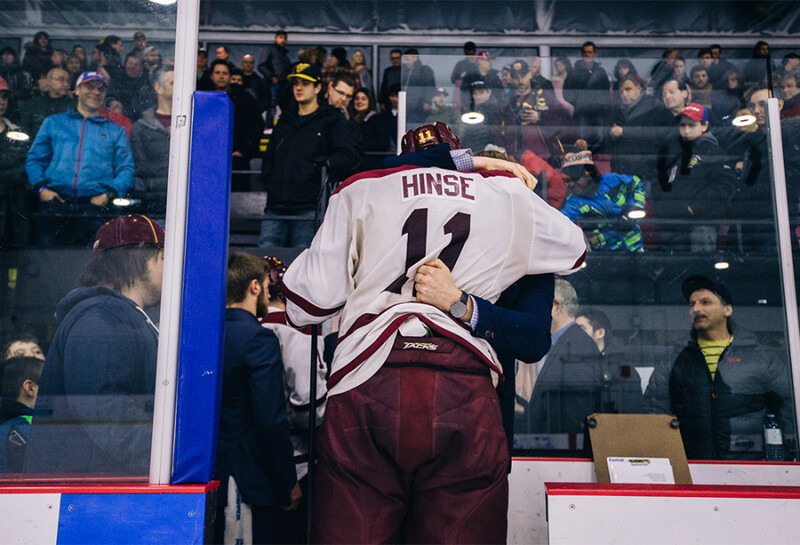 Hinse, who initially announced his retirement from varsity hockey last year, decided to extend his stay because he wanted to win a U SPORTS championship. While he was unable to accomplish that, he still relishes in helping the team get past the first round for the first time since 2001. Playing the final game of a best two-of-three series, both teams faced elimination and a chance to face the McGill Redmen in the Ontario University Athletics East Final this week. While Concordia dominated Queens in games one and two, the Stingers were off to a slow start which allowed the Gaels to gain the momentum and establish their rhythm. Third-year forward Darcy Greenaway gave his team the game-winning goal 9:41 seconds into the first period. “We didn’t start the game like we wanted but I find that the guys battled hard until the end and this is our identity,” said head coach Marc-Andre Element. From that point onwards, the Maroon and Gold struggled to sustain consistent momentum against a Gaels team that played their best defensive game of the entire series. Queens shutdown Concordia through the neutral zone and blocked the shooting lanes, often limiting them to shots from the perimeter. Once again, goaltender Kevin Bailie was a brick wall, stopping all 42 shots. In three games, the fourth-year netminder stopped 122 of 124 shots. Phillipe Hudon, arguably one of the best players in the series, looked like a man on a mission, peppering Bailie with shots but was denied every time. The assistant captain had one goal this series in game two, when he scored in an empty net. Despite outshooting the Gaels each period, quality chances were few and far between for much of the first half of the game. Meanwhile, Concordia’s goaltender Philippe Cadorette continued to make key saves and keep his team in the game. He ended the night with 28 saves. Towards the end of the second period, forward Philippe Sanche broke out through the neutral zone to get on a breakaway but was stopped by Bailie. That play seemed to have given the Stingers a much-needed spark as they managed to attract an interference penalty on Queen’s Patrick Downe. The Stingers started the third period on the man-advantage but were unable to score. Concordia had a few quality chances but the Gaels managed to shut them down. With Hinse, De Luca and Hudon out in the final minutes of the game, the Stingers gave it their all to tie the game but Queens potted an empty net goal to kill their momentum. Despite their elimination, the sentiment among the players was one of overall pride and positivity. The future is indeed bright for the Stingers. Under Element, who has completed his first full year as head coach, they finished in second place in the OUA East division with 40 points right behind McGill. With 11 guys finishing the season with at least 10 points and a consistent goaltender in Cadorette, the Stingers will be a force to be reckoned over the next couple of years. Much of the team will remain intact going into next season, with Hinse and fourth-string goaltender Antoine Marchand graduating at the end of the year. While Marchand didn’t see much playing time in his four years, he is a player who will be sorely missed by the team. De Luca, who ranked fourth in the country in points and second in goals, expects to take on more leadership responsibilities heading into next season. While this year’s rookies will inevitably step up their leadership game next year, Concordia will still have a core group of leaders with assistant captains Raphaelle Lafontaine, Dominic Beauchemin and Hudon all coming back. Hinse, who said he will come back and visit the team, had some wisdom to impart to his Stingers family.